The Painted mask workflow helps you get started with painting masks in the Graph. You can edit the mask as many times as you want and see the results in real time. See also Painted mask node. 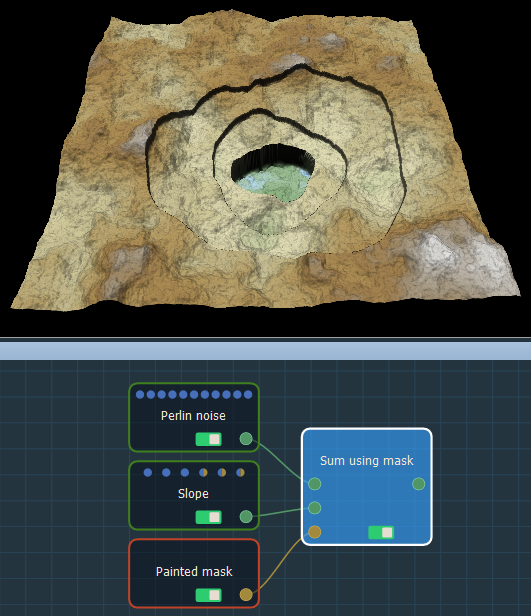 In this workflow, you will compose two terrain generators and paint a mask to create height and depth in the output terrain. Create node > Terrain generation > Perlin noise. 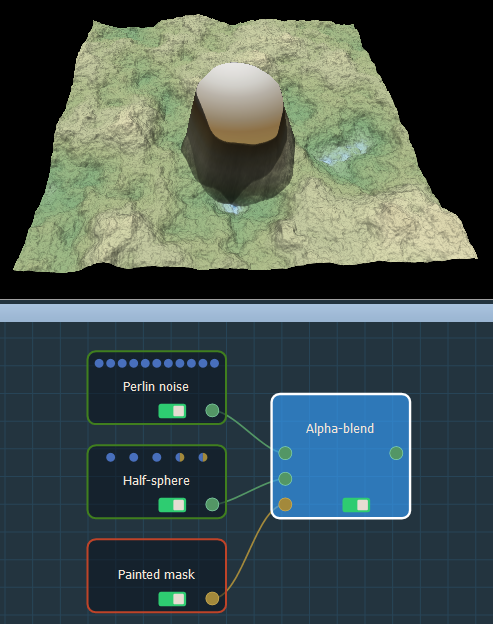 This node creates a terrain using a Perlin noise generator, one of the generators most frequently used to create a terrain. 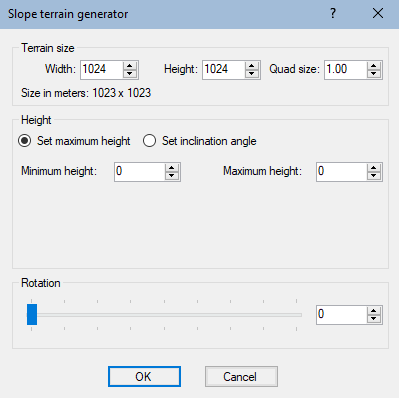 Create node > Terrain generation > Slope. 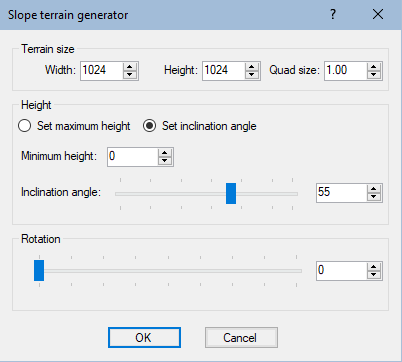 This node creates a terrain plane with an editable inclination and orientation either by specifying the minimum and maximum height values or by adjusting the slope angle. Create node > Mask generation > Painted mask to paint a mask directly in the 3D View. Create node > Terrain composition > Sum using mask..This node sums the generators and the mask to create an output terrain. Link the nodes as follows. Double click on the Slope node to open its parameters. The default inclination angle and minimum and maximum heights is 0. You need to modify these values; otherwise, the Sum using mask node has no effect and the output terrain appears exactly like the Perlin noise input terrain. 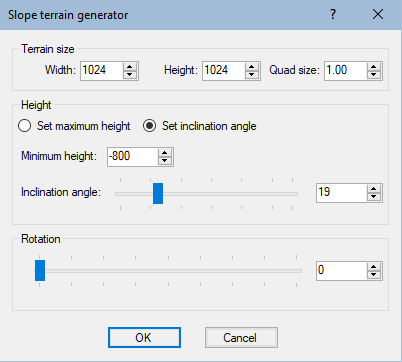 Click Set inclination angle and use the slider to create height in the terrain. Double click on the Painted mask node to open its parameters. With the Edit mask button activated, use the brush sliders to change the brush size, intensity, and fall-off and draw the mask directly in the 3D View. The mask is updated in real time. Lighter allows you to draw the mask and Darker to erase the mask. Size slider sets the size of the brush depending on the level of detail that your mask needs. Intensity slider sets the intensity of the color of the brush. Fall-off creates the appearance of translucency. Use the slider to set the attenuation of the intensity of color from the center. Increasing this value decreases the visibility of the fall-off level displays and vice versa for decreasing the value. 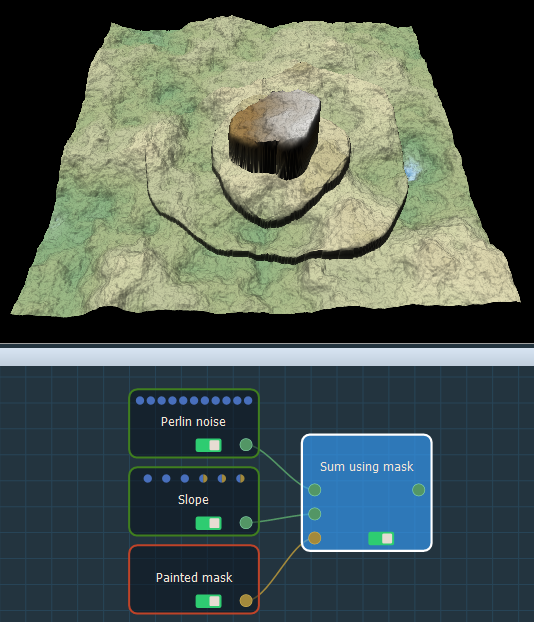 Toggle between the Painted mask node and the Sum using mask node to see the effects on your terrain in real time as you draw the mask. The result creates height where you painted the mask. To create depth in the terrain, set the minimum height to a negative value. The result creates depth where you painted the mask. In this workflow, you will create an alpha composition between two terrains at locations defined by a mask. Create node > Terrain generation > Perlin noise to add the Perlin noise generator. Create node > Terrain generation > Half-sphere. This node creates a half-sphere or semi-ellipsoid plot. Create node > Mask generation > Painted mask to paint mask in the 3D View. 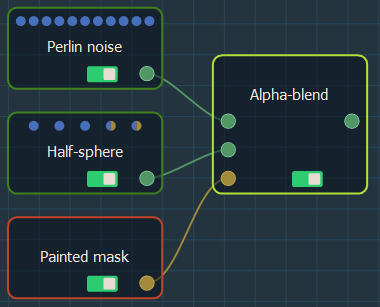 Create node > Terrain composition > Alpha blend to create an alpha composition between two terrains at locations defined by a mask. Link the nodes as follows so that the Half-sphere appears in the Perlin noise terrain once you have painted the mask. Set the brush sliders to change the brush size, intensity, and fall-off and draw the mask directly in the 3D View. Toggle between the Painted mask node and the Alpha blend node to see the effects on your terrain in real time as you draw the mask. The Half-sphere appears in the Perlin noise in the areas where you drew the mask. In this workflow, you will create Ridged noise in a Cone terrain generator in the areas where you paint a mask. Create node > Terrain generation > Cone. This node creates a terrain in the form of cone by elevating the terrain from the outside to the center, conically. Create node > Terrain generation > Ridged noise. This node creates a terrain using a Ridged noise generator. It creates sharp discontinuities and patterns that resemble crests and ridges. This noise is usually used to create sharp mountains. 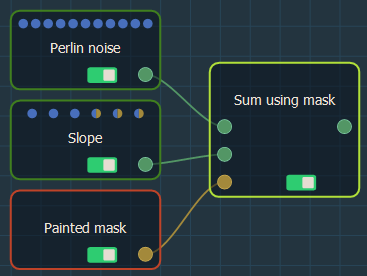 Create node > Terrain composition > Sum using masks node to compose the three nodes. Link the nodes as follows so that the Ridged noise appears in the Cone terrain once you have painted the mask. If you linked the Cone node to the first input connector and the Ridged noise to the second input connector, the cone would appear in the Ridged noise terrain. 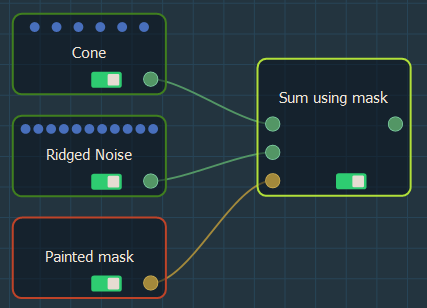 The Ridged noise produces noise in the Cone in the areas where you drew the mask.